The fan circuitry on a turbo Regal is fairly simple in concept in spite of the three relays used to operate the fan. It delivers two fan speeds from a single speed electric fan motor by dropping the supplied voltage via a resistor in the low speed circuit (resistor is mounted on the fan) so that the fan runs more slowly due to the reduced voltage. The high speed circuit receives full voltage by bypassing the resistor. As stated, three relays are used to control the fan- a low speed relay, a high speed relay, and a delay relay which turns the fan on after the engine is off to drop under hood temps in an attempt to reduce the possibility of oil coking in the turbo. The low and high speed relays are small in size while the delay relay is considerably larger. All are mounted on the driver's side inner fender. Relays are simply electro-magnetic switches that are designed to handle heavy electrical current draws and are triggered by an electrical signal rather than a "toggle". In essence, in the simplest form, there are two terminals that provide current in, and out, to the device being powered. Then, there are two more terminals-one of which brings the switching power into the relay, and the other which completes the circuit to ground. In the fan circuit, there is always voltage on the "in" side of the switching circuit when the key is on for the low and high speed relays and the ground is "made" as described below. The delay always has current, even with the key off, in order to trigger the timer. All three relays receive fan voltage directly from a heavy red wire which comes from a fusible link attached to the main battery cable post on the starter. A black/red or black/pink wire takes the power to the fan from the relay. Grounding the appropriate wire on each relay completes the switching circuit and triggers the relay which should make the fan run. The low speed relay provides voltage to the white ceramic resistor mounted on the fan via a black/red wire. This relay is activated when the dark green wire is grounded. 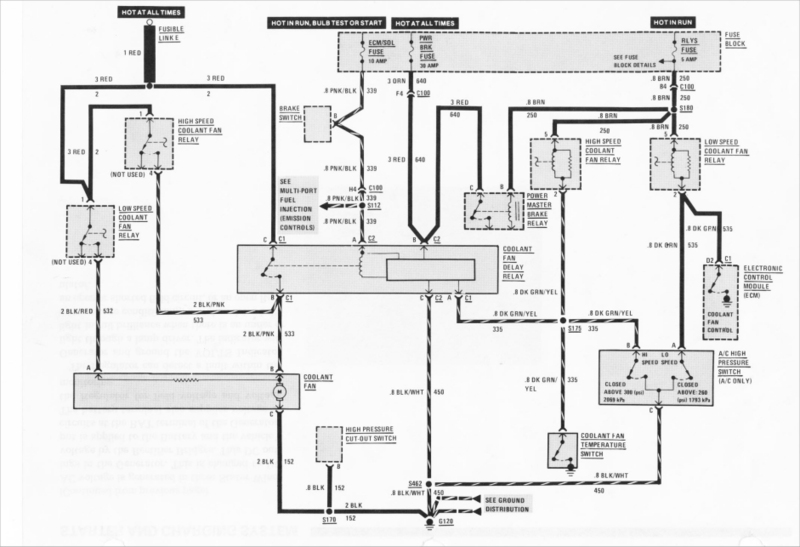 This grounding may be triggered by the ecm via the temperature programmed into the chip, or, by the low pressure contacts in the AC high pressure switch mounting on the back of the compressor piping. The low speed relay has two red wires (one terminal), a black/red wire, a brown wire, and two dark green wires (one terminal). The high speed relay provides voltage directly to the fan motor via a black/pink wire which does not go through the fan resistor. This relay is activated when the dark green/yellow wire is grounded. This grounding may be triggered by closure of the contacts in the coolant fan temperature switch close, or, when the high pressure contacts close in the AC high pressure switch mounted on the back of the compressor piping. The high speed relay has a red wire, a black/pink wire, a brown wire, and a dark green/yellow wire. This relay enables the fan to continue running a short time after the engine has been shut off. A solid state timer removes the ground path after a few minutes. Note that it gets power from the ecm/sol fuse (pnk/blk) which is hot in Run as well as from the pwr brk fuse (red) which is always hot. The relay provides power to the fan via the same black/pink wire used by the high speed relay and is likewise triggered via a dark green/yellow wire that uses the same contacts as the high speed relay (AC high pressure switch and coolant fan temperature switch) If the coolant temperature is not well over 200 degs F, then the ground path thru the coolant fan temperature switch will not be there to trigger the delay relay, and, the fan will not operate after the engine has been shut off. This relay is the larger relay as compared to the two others. This relay is not only expensive, but, it is troublesome. It commonly fails from water contamination which may be prevented by smearing a little RTV around the bottom where the case snaps over the internals. It also has a habit with age of turning the fan on when the car is parked and running the battery down mysteriously. Note that this relay may never turn the fan on when the engine is turned off as the AC line pressure drops quickly and the coolant temperature is not high enough to close the contacts in the coolant fan temperature switch. Many eventually unplug this relay and don't use it as it seldom operates on a car with a properly operating coolant system and a 160 deg thermostat plus an aftermarket chip that turns the fan on between 160-170 degs. This should prevent the car from ever getting hot enough to trigger the delay relay. For those that are used to using a meter and/or test light for trouble shooting, there is a wiring diagram of the factory fan circuitry at the bottom. Note that it is for an '87 which uses a RLYS fuse (an '86 does not-tho' it still uses the brown trigger wire). The first thing to determine is if the fan operates at any mode (low speed when the coolant temperature has reached the temperature programmed into the chip, or high speed when the the AC is flipped on). If the fan refuses to run in either mode, I would suggest first examining the connector between the fan and the wiring harness to see if it shows signs of overheating or visible burn marks. It's common to find a fan connector that no longer makes the connection due to overheating over time. If the connector appears good (unplug it and look inside it as well as examining the outside). Now check the ground wire in the plug to see if a ground exists. Do this by setting your meter to ohms, then place one probe on the ground connector in the plug and one probe on the engine. It should show Zero Ohms, or very close to it if the ground is working. If it does not, it is probably time to check the ground connections on the back of the passenger side head as that is were the ground wire terminates. The fan will not work without a ground connection. If the ground wire checks out good, then connect a 10 gauge wire to the positive terminal on the battery and touch the other end to the positive terminal on the fan. The positive terminal is the one that the resistor connects to (black/pink wire). If good, the fan should immediately run when 12 volts is applied from the battery. This, of course, assumes the ground circuit is good. Now, if the fan runs when voltage is applied directly to it, and the connector is good, then go to the two smaller relays (high and low). The red wires that connect to each of the relays should have 12 volts in them whether the key is on, or off, as they come directly from the fusible link that connects to the starter post. If you do not record voltage in these wires, check the fusible link at the starter to be sure it is not shorted out. If you have 12 volts (battery voltage) at the red wires, turn the key to the "Run" position and check the brown wires on the relays for 12 volts. If there is no voltage in the brown wires, then the RELYS fuse is probably blown. This is on the '87s. The '86's don't have a RLYS fuse and I assume the brown wires go to another fuse....Thanks to Al (Nasty) who has informed me that the '86's use the AC fuse for powering the brown wires! Okay, if the fan is good, and both the red wires and brown wires have voltage, then it would appear that the problem is with the relay(s) or with the triggering of the relays. The following may be used to troubleshoot either the low speed circuit, the high speed, or both. Go to the dark green wire on the low speed and ground it to the engine directly. You can either tap into the wire, or, pull the connector off the AC pressure switch and ground the side with the dark green wire. If the fan runs, then the low speed relay is good, but, there must be a problem with the circuit between where you grounded it, and the ECM. Or, there is a problem with the ECM, itself. This assumes the car is reaching the temperature programmed into the chip, and also assumes that the ECM is receiving temperature information from the temperature sensor (not the fan temperature switch that controls high speed, but, the one that feeds coolant temperature info to the ECM. Remember there are three temperature sensors....the fan control switch, the idiot light sensor, and the temperature sensor that feeds the ECM.) If a scantool shows the proper coolant temperature, I would assume the problem is not with the temperature sensor, but, with the programmed fan on temperature in the chip, with the circuit going to the the ECM, or the ECM. Here is a different approach for the low speed side that might be less confusing. Pull the connector off the low speed relay. The connector terminal on the low speed relay with the two heavy red wires should be hot at all times. Is It? The brown wire connector terminal should be hot when the key is in the on position. Is it? If yes, to the red wires above, stick a jumper wire in the connector between the red and the black/red wires. This gives a direct shot between the battery and the fan. The fan should run. Does it? If it does not, then it would appear to be a problem in the fan connector. They have a bad habit of burning the terminals in the plug over time. If it does run (when connecting red in the connector to the black/red), then it would appear the relay is bad, or the ecm is not grounding the green wire when it gets up to whatever temp is programmed into your chip....it was over 200 in the stock chip. You can put the connector back on the relay, cut into the green wire and attach a ground wire to it...turn the key to the on position and the fan should run..if not, it is the relay assuming the fan connector checked okay. For the high speed circuit, ground the dark green/yellow wire. You can do this by pulling the wire connector off the fan temperature switch and grounding it, or by pulling the connector off the pressure switch and grounding the dark green/yellow side. If the fan runs when grounding this side, then the relay is good. If the AC is properly charged, the fan should run on high when the AC is turned on. If the fan runs when grounding the wire, but, not when turning on the AC, then the pressure switch is probably bad. Normally, I believe the fan coolant switch closes at a temperature over 200 degs. As I recall, the book claimed the turn on temperature for the switch is 228 degrees, but, others have reported that the switch may activate as low as 203 degrees with the book being in error. Therefore a car with a good cooling system may never get hot enough to turn the fan on to high speed unless the AC is on. To check the delay relay, turn the key to the "run" position, squeeze the connector on the coolant temperature switch and pull up. Insert a wire into the connector and connect it to ground, the fan should run on high speed. Disconnect the wire, turn off the key, reconnect the wire, and the fan should run up to ten minutes and then turn off. Okay, here is another approach. On a cold engine that has not been running. Look at the AC compressor and remove the connector that has two wires with the following colors. Solid Dark Green wire for one wire and a Striped wire that is Dark Green with a Yellow stripe. Then look at the top of the intake manifold and remove the connector from the coolant fan temperature switch. It has a single striped wire-Dark Green with a Yellow stripe. Now, turn the key on to the "Run" position-don't start the engine. Take a piece of wire and attach one end to a good ground (battery negative terminal, engine block, sheet metal, etc...just make sure it is grounded). Take the connector you pulled off the AC compressor and touch the other end of the ground wire, you just made, to the terminal in the connector that goes to the Dark Green wire. The fan should now run on Low. Does it? If it does not, there appears to be a problem in the low speed relay, the fan resistor, or the wiring. If it does, then the circuit is good and all is working correctly. Now touch the ground wire to the other terminal in the connector with the Dark Green/Yellow wire. The fan should now run on High. Does it? If not, go back to the high speed relay and connections. Assuming the fan worked on both speeds, plug the connector back to the AC compressor. The fan should not come on either speed. If it does come on, then it would appear that the switch on the compressor has gone bad and needs to be replaced. It simply unscrews and another one put on. It will not dump the freon when unscrewed. Now, take the single wire connector that went to the coolant fan temperature switch and hook the ground wire that you made up to it..fan should run on High again. Reconnect it to the coolant fan temperature switch. The fan should not run. If it does, the temperature switch would appear to be bad. There are three temperature sensors/switches. The fan coolant temperature switch is located on top of the intake by the throttlebody on the driver's side. The idiot light switch is in the front end of the intake on the turbo side of the thermostat housing. The ecm temperature sensor is in the front of the intake on the alternator side of the intake.